How can hybrid cloud computing serve your enterprise IT strategy? "How can hybrid cloud computing serve your enterprise IT strategy?" Hybrid Cloud computing essentially continues to offer businesses all the benefits associated with the public cloud whilst enabling them to continue to have choices of storing certain types of data privately. This hybrid cloud computing white paper guides on how hybrid cloud file server can be used by businesses to achieve their objectives, creating a virtual, cloud server managed by you - the service provider. 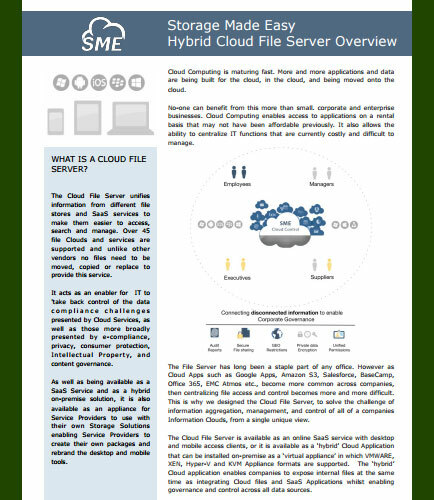 What is a hybrid cloud file server? What are its solution features? How can hybrid cloud application help to solve the challenge of information aggregation, management, and control of all the companies of Information Clouds, from a single unique view? The Cloud File Server enables special folders to be set that all users in the company can instantly access. The Cloud File Server enables unified access permissions for access across all Clouds that are mapped and exposed to the user base.